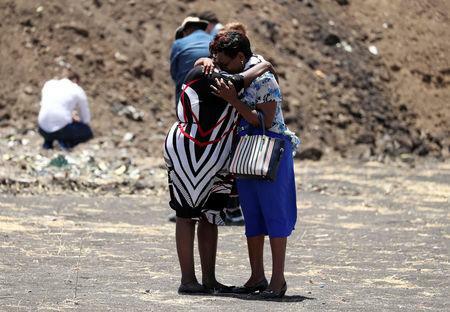 ADDIS ABABA (Reuters) - Ethiopian Airlines flight 302, which crashed killing 157 people, had an unusually high speed after take-off before the plane reported problems and asked permission to climb quickly, said a source who has listened to the air traffic control recording. Experts say pilots typically ask to climb when experiencing problems near the ground in order to gain margin for maneuver and avoid any difficult terrain. Addis Ababa is surrounded by hills and, immediately to the north, the Entoto Mountains. No more than two minutes later, the air traffic controller was in communication with other aircraft when the voice from Ethiopian Airlines flight 302 interrupted, saying "break, break" - signaling that other non-urgent communications should cease. He sounded very scared, the source said. Other satellite data tracking the plane has not been made available publicly. In the Lion Air crash, investigators are examining the behavior of a new anti-stall system installed on the 737 MAX that led to the plane gaining and losing altitude as the pilots fought for control against the automated system. Boeing is expected to finalize a software fix for that system within a week to 10 days, sources familiar with the matter said earlier on Saturday.